Our speaker was Dr Dave Newbold who is Head of Particle Physics at Bristol University. He is involved with research at CERN using the CMS (Compact Muon Solenoid) experiment on the LHC (Large Hadron Collider). His talk was entitled "The Missing Universe and how to find it" which explained how, amongst other things, particle physicists are searching for a new type of matter called "dark matter" that keeps galaxies from flying apart. Dr Newbold began by saying that at a very basic level fundamental physics is an interplay between mathematics, experiment and philosophy. Physicists are trying to answer the two questions –"what is everything made of?" and "what forces give things structure?" However, these questions then lead on to further more detailed problems such as" where has all the antimatter gone?" that was produced at the birth of the Universe and "do we live in one of many parallel universes?". Science has come a long way in its understanding of the basic building blocks of matter. Classical philosophers began thinking that everything consisted of the four elements – earth, air, fire and water. The latest physical theories have drilled down into matter to propose that the smallest units are quarks; which for convenience are referred to as particles but in truth are small "wave-packets" of energy. In order to look for new and exotic forms of matter scientists have to design experiments that can take apart ordinary particles to see what lies inside them. Unfortunately everyday particles are very robust and so physicists have to accelerate particles to near the speed of light and then crash them head on in order to study their underlying structure. Basically, this is what the LHC is designed to do. Using superconducting magnets it guides pulsed beams of protons in opposite directions around a 27km-long circular vacuum chamber buried underground. When they are travelling fast enough the particle beams are channelled to collide within one of four huge experimental machines dotted around the underground ring. The collisions are then captured by various layers of detectors around the impact sites. 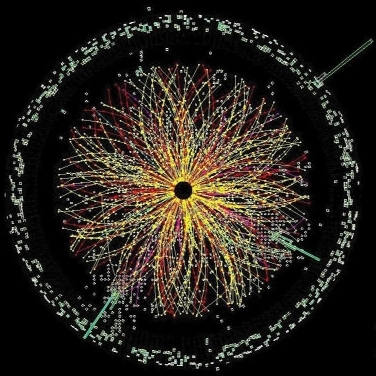 The collision rate of the protons is so high that it is not possible to record the data from every single collision and so high speed computers analyse them in real time and only record events that are deemed "interesting". Amongst the many millions of collisions Dr Newbold is hopeful that a number will show the production of supersymmetric particles which are dark matter candidate particles. The matter is called "dark" as it can only be detected by its gravitational influence on surrounding material. It was realised quite a while ago that if galaxies only consisted of the matter that was observable then stars in the outer areas should be flung off into space. So it was proposed that there must be an invisible form of matter that adds to the sum of the gravitational forces within a galaxy. In fact it is proposed that dark matter makes up 23% of all the matter in our Universe compared with the mere 4% that makes up normal matter.